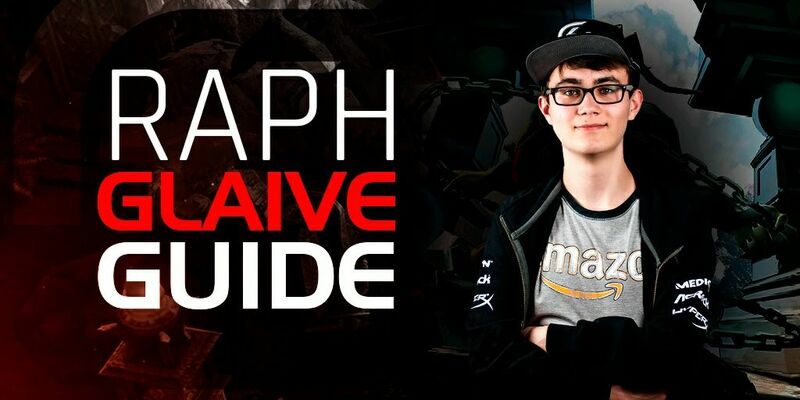 Hello guys and welcome to my Signature Glaive Jungle Guide on how I used to play Glaive and reach top rankings. My name is Raphael “Raph” Kalab and I am playing for SK Gaming more than 1 year. This hero is one of my favorites, because the way I am playing him makes so much fun. Glaive can be really strong in the early game when you manage to dodge enemy abilities and kite to finally kill them and have a big advantage in the jungle. In late game he will be even stronger when he has finished his Sorrowblade and Bonesaw / Breaking Point / Tornado Trigger. Glaive's heroic perk gives him every critical strike a bonus cleave Dmg to enemies that are 4 meters in front of him. When you build critical damage always try to hit at least 2 people with your basic attacks. Glaive's Afterburn is allowing him to dash to the enemies and knock them away or stun them onto a wall. It is very effective in the early game, especially when the enemy is squishy, you just need to use it on your enemy and then do your Twisted Stroke for extra dmg. After you might just need some auto-attacks to secure the kill. Afterburn is also very good, when you are ganking the lane. Try to do it when the enemy doesn't expect it, so you and your laner can kill the enemy. Afterburn is strong when you have to protect your teammates or for pulling them into your allies. To protect your allies just make use of this ability and push the enemy away. Always try to hit your enemy against a wall so he gets stunned. When you overdrive Afterburn you get slightly more damage on it and a shorter cool down. Twisted Stroke is very effective in the early game and before you are going to start a fight. It gives you a critical hit and bonus damge. If you overdrive Twisted Stroke you get bonus damage and a higher critical chance. When you have 20 stacks on Bloodsong it will make AoE damage in a certain area. With less stacks it will do less damage. Bloodsong is best used when you use your Afterburn first to stun the enemy onto a wall, then use	 Twisted Stroke on your enemy and when they are low you finish them with your Bloodsong. As well you can do it in the beginning of a fight so the enemy is lower, but I don't recommend that, because the enemies can just run away and heal up again, but you lost your stacks. The range of Bloodsong has a 4,5 meter range so it's good when the enemy is trying to run away with low health and you will still be able to secure the kill. When you overdrive Bloodsong you get extra dmg per stack and more base dmg. Glaive is a frontliner and needs a support that can shield him, or assist him with crowd control and positioning. Phinn is the support for more advanced playstyles. Polite Company provide a solid amount of fortified health, but can also be incredibly strong to pull enemies closer to Glaive; making Afterburn much easier to use effectively. Ardan is the natural support fitting for Glaive, giving him a huge amount of fortified health and move speed to execute whatever play he wants. Adagio is a support that fits well for Glaive if Glaive is expected to be the frontline of his team. The heal & damage buff of Adagio is reliable and consistent, and makes Glaive very comfortable to explore possibilites for ganks and initiating teamfights. Ringo is a good combo for Glaive. They can both react fast and quickly deal damage to their target. Kestrel can use her Active Camo to set up a combo with Glaive	 Afterburn to chain stun and securing kills easily with her high damage. Vox is a very mobile hero, who can quickly go in and out of fights, making it very strong with Glaive's capability to put enemies out of position. Celeste has very high damage from a distance. This makes Celeste ideal to have with Glaive, because she can finish off the targets that Glaive Afterburns. Skaarf needs protection and Glaive can provide that. He can Afterburn enemies like Krul off of Skaarf. Skye can, with a Frostburn, slow enemies, making it easy for Glaive to set up a good Afterburn. As Glaive you should awlays try to kite your enemies. When you think that you should go in then Afterburn and try to split the enemies to pick out one kill. You should also stay behind your support to not get any USELESS dmg on you. Luckily, Glaive is tanky by default, due to his base health, so taking some damage is not the worst. Playing Glaive is what I really love and his Afterburn can secure kills and due to his natural tankyness he can stay longer in fights and be a threat to the enemy. I hope you enjoyed reading and watching my guide.